This article charts the evolution of the UK government’s ambitious vision for the archive sector, Archives Unlocked. It traces the evolution of that vision from the roots of the audience-focused strategy of the UK National Archives, Archives Inspire. The authors place a particular emphasis on the process of co-creation and the emergence of the key strategic themes of trust, enrichment and openness. These global themes are brought to life by inspiring case studies and think-pieces while also being supported by a concrete action plan focused on clear deliverables and outcomes that will have the greatest impact. The authors argue that the archive sector is going through a paradigm shift from paper to digital, while observing that digital technology presents as many opportunities as it does challenges. The article reflects on what it means to be a disruptive digital archive and how this challenges some of the established norms of archival practice while also making the case for greater collaboration; arguing that the challenges and opportunities facing the sector can only be met by enhanced partnership working at the local, regional, national and international level. The authors believe that the approach adopted will not only allow archival content, in whatever format, to continue to enrich people’s lives but also change the way that people think about archives. Imagine a world without archives. Without records, people could not prove where and when they were born or who owns the property they live in. They could not trace their ancestry, explore their collective and individual identities or hold government and organizations to account. The impact of archives is felt right across society, underpinning academic research, fuelling the digital economy and inspiring innovation and creativity. In short: archives matter! In this age of inquiries, public appreciation of the importance of archives has never been higher – but this comes with increased expectations about ease of accessibility and the ability to find everything at the click of a mouse. Archives are also at a cross-roads; facing unprecedented opportunities, especially the opportunities offered by digital technology. They need to undergo fundamental transformation to capitalize on these opportunities. In April 2015 The National Archives2 launched Archives Inspire.3 This four-year strategy aspires to change the way that people think about archives by articulating what archives are for, rather than what they do. Archives Inspire is an audience-based strategy and recognizes that The National Archives needs to think and organize itself differently if it is to meet the needs of its four core audiences: government, the public, academia and the archive sector. At the outset, Archives Inspire explicitly identified digital as the single biggest challenge facing the organization and the sector, while implicitly identifying the need for greater collaboration and partnership. For the archive sector, Archives Inspire recognized the need to work together with the sector and its stakeholders to make the case for archives as a vital part of the nation’s heritage. Archives Unlocked4 is the UK government’s strategic vision for archives launched by the then Minister for Digital and Culture, Matt Hancock, on 29 March 2017.5 The development of the vision was led by The National Archives. However, it was very much the sector’s own vision, developed through an extensive process of co-creation with the sector and with key partners. The scale of the challenges facing archives can be overwhelming, so the vision needed to present an inspiring message for the future, to help direct archives through the cross-roads of change. It also needed to be something that resonated with the whole archive sector, while providing a compelling message for decision makers and funders. The UK benefits from an extensive distributed archival collection and from sound professional practice that has evolved over the last century. The National Archives works with over 2,500 archives across the country, funded by and belonging to an expansive range of organizations including local authorities, universities, businesses, charities, religious bodies and private individuals. Each archive is different and the leadership approach to the sector reflects this diversity. Together the sector forms a rich ecosystem of interconnected collections and information and a profession that is well networked to support researchers to connect and analyse records from many different sources. The breadth of this infrastructure is a great strength as it means archives are not dependent on one source of funding, and the ecosystem can evolve and adapt as funding climates change. However, such diversity also presents challenges when creating overarching strategies that are meaningful to such a broad constituency. Furthermore, agendas can change quickly so the new vision needed to focus on the fundamental values that archives bring to society, creating a vision that would remain inspiring over time while providing both sustainability and the impetus for sector transformation. From this wide-ranging co-creation process, a coherent message emerged about the role of archives. This was then distilled into three core values: archives will strengthen society through the trust they inspire, the enrichment they offer and their openness to all. In 1989 in England, 96 people tragically lost their lives owing to overcrowding in a Sheffield football stadium. The Independent Police Complaints Commission, the body then responsible for overseeing complaints against police forces in England and Wales, conducted an investigation into this tragedy, which became known as the Hillsborough disaster. The investigation7 provided a powerful example of trust illustrating the vital role archives play in providing information and evidence to underpin the democratic process. The integrity of such archival processes and safe custody of records like these reassure the public that archives can be relied on to support accountability. The vision used further case studies, including the archive of the children’s charity, Barnardo’s,8 the archive of the John Lewis Partnership, one of the UK’s most prominent retailers,9 and the digital mapping project for the West of England, Know Your Place,10 to bring to life, in practical and inspiring ways, how archives are inspiring trust, enriching people’s lives and opening themselves up to innovative use and reuse. These practical case studies were complemented by think-pieces from contributors within and beyond the archive sector, challenging existing norms and provoking new ideas for the future. Finally, the co-creation process explored the key development challenges facing the archive sector, to enable the creation of a clear action plan to underpin the vision. The action plan was a vital part of building confidence in the vision and in securing commitment from the wide range of cross-sectoral delivery partners. Three specific areas for development were identified within the action plan: to build digital capacity, engineer resilience and demonstrate impact. The plan includes a wide range of initiatives under each area, including pilot programmes and innovation testing, targeted grants programmes, training programmes, guidance and advice. The focus for the first year has been on developing coherent and multifaceted strategies for workforce development and digital capacity building. 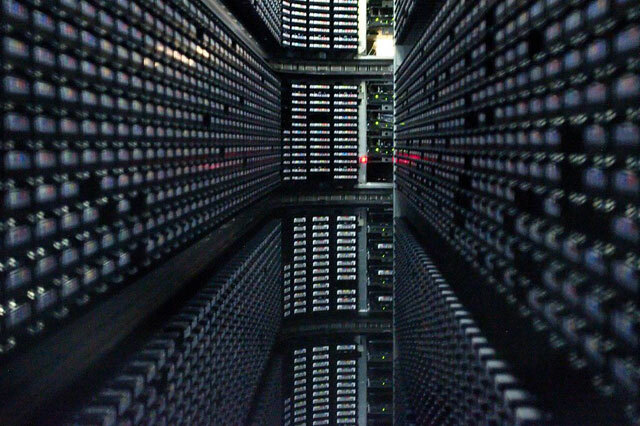 As outlined above, Archives Unlocked frames the major challenges facing the archive sector. Of those challenges, the most pressing and the most urgent is the challenge of digital. The shift to digital is transforming every aspect of the archival landscape, be it appraisal and selection, preservation, access, presentation or use. Each and every archival function is being or will be profoundly changed. Where yesterday’s records were tangible, those of today and tomorrow will be intangible. Even the very nature of records will change as data and code themselves become not only part of the record, but the record. Archives need to develop new capacity and capabilities to ensure that digital records continue to be kept and used. develop digital standards within the archive service accreditation scheme, to support improved management of hybrid and digital collections. Since the vision was launched, The National Archives has worked hard to take forward initiatives to support this digital programme. An Archives Unlocked board has been established, comprising representatives not only from archives, but from the wider digital, professional and cultural sectors, to take forward the vision. Over the course of 2018-2019, working in conjunction with the board, a coherent strategy for digital capacity will also be developed. In the meantime, The National Archives has already supported some specific initiatives. For example: research in Dorset, south-west England, into digital audience expectations, which will be used as a template for other archives; funding and support for a number of pilot projects in digital preservation; and the delivery, in collaboration with the internationally renowned British arts organization, Tate,16 and the not-for-profit digital services and solutions body, Jisc,17 of digitization seminars to help address sector need. In addition, the foundations have been laid for a number of broader pieces of work, including an invitation to tender for the facilitation of a Digital Action Learning Set, sharing learning through a series of events to join up knowledge and approaches in the digital area, and the commissioning of an audit of sector digital skills to inform a training and development programme. Archives Unlocked and the challenges it aims to address are of relevance to other sectors too, so The National Archives has established a Memorandum of Understanding (MoU) with Jisc, developed its current MoU with Research Libraries UK18 and continues to work on a range of issues with the DPC. forge partnerships with other archives progressing digital transformation. This searching focus on the challenge of digital ensures that The National Archives can continue to provide leadership and support to the wider archive sector as the outputs of this high-level work filter down into common practice. However, in order to achieve the paradigm shift and to find solutions to the digital challenges and opportunities facing archives, the sector also needs to invest in digital skills and undertake digital research. Two years ago The National Archives commissioned work on digital research challenges, which was then subsequently taken forward to form a Digital Research Roadmap,22 since wrapped into the organization’s broader Research Strategy.23 The Head of Research is currently developing research themes and questions so funding can be targeted and research partnerships developed that will test approaches to address some of the key problems raised by the shift to digital. Staff at The National Archives are already working on projects to explore innovative solutions. For example, the Archangel project in partnership with the University of Surrey24 is investigating whether distributed-ledger technology could provide a new approach to digital authenticity. It needs to be stressed that digital brings as many opportunities as it does challenges. The National Archives’ recent research project, Traces through time,25 uses linking methodologies alongside mathematical certainty measures to suggest potential matches for archival search queries, offering researchers results they might otherwise have missed. It is through research and partnerships such as these that the wider information sector, both nationally and internationally, will move forward. Collaboration is the golden thread that links the organizational strategy of the UK National Archives, Archives Inspire, and the UK government sector vision, Archives Unlocked. The National Archives’ international strategy, Archives Inspire the world,26 aims to leverage international collaboration to build a future for archives on a global scale. This is an international calling card encouraging collaborators from around the world to work together to drive the development of an exciting future for archives. standards by supporting policy development, standard setting and access to legislation. Archivists are born collaborators and there should be no geographical borders to collaboration. The challenges and opportunities facing the UK archive sector are shared by archives around the world. This is especially true of digital access and preservation. Digital preservation is an international team sport but, like any sport, it requires determination, effort and focus to achieve results, not just a predilection for collaboration. Archivists are fortunate to work in a sector that finds itself at a once-in-a-lifetime watershed moment. They have the commitment and the appetite, if not yet all of the skills, to enable transformational change. The National Archives is as proud of being the leadership body for the archive sector as it is privileged to be the custodian of some of the nation’s most iconic documents dating back more than 1,000 years. Archives present a uniquely personal experience within the cultural sector and the sector must continue to engage audiences in new and exciting ways. Digital has transformed the way that researchers and archivists think about records, the way that archives look after them and the way that access is provided to them. But this is not really about a shift from paper to digital; it is fundamentally about preserving and rejoicing in the nation’s shared physical heritage while exploiting the endless virtual opportunities presented by digital technology. Digital has transformed access to that shared content, opening up collections and transforming people’s lives wherever they live, irrespective of where the record resides. The challenges and opportunities facing archives around the world at the local, national and international level demand strong strategic leadership. The Forum of National Archivists (FAN), a section of the International Council on Archives,30 is the body of national archivists responsible for developing high-level strategic responses to the contemporary challenges of managing archives. FAN has identified digital as its key strategic priority and is in the process of sharing best practice and encouraging new approaches that can inform and benefit national, regional and local practices. This is an exciting time for archives: for those who care for them and for those who use them. The records, both physical and digital, held in archives around the UK and across the world can change people’s lives. There can be no doubt that archives matter. The challenge for archivists is to ensure that the records of the past and the future not only survive but thrive. By working in partnership, as part of a broader archive ecology, archives can ensure that more and more people are connected and inspired by the records they look after and ultimately help change the way people think about archives. 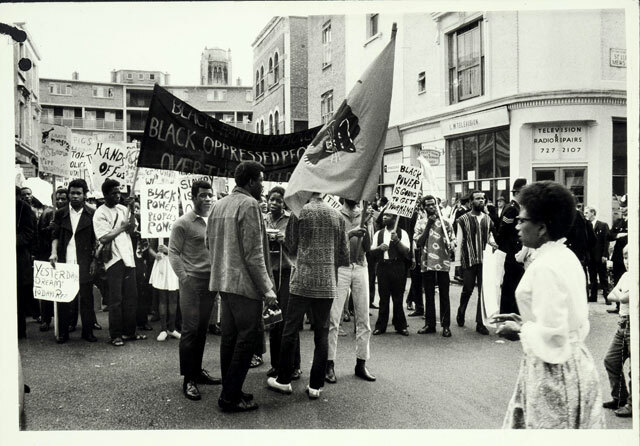 Iglikowski V and Hillel R, 21 October 2015, Rights, resistance and racism: the story of the Mangrove Nine, The National Archives blog: http://blog.nationalarchives.gov.uk/blog/rights-resistance-racism-story-mangrove-nine/ (accessed 18 May 2018). The National Archives: http://www.nationalarchives.gov.uk/about/our-role/ (accessed 15 May 2018). The National Archives, Archives Inspire: http://www.nationalarchives.gov.uk/about/our-role/plans-policies-performance-and-projects/our-plans/archives-inspire/ (accessed 15 May 2018). 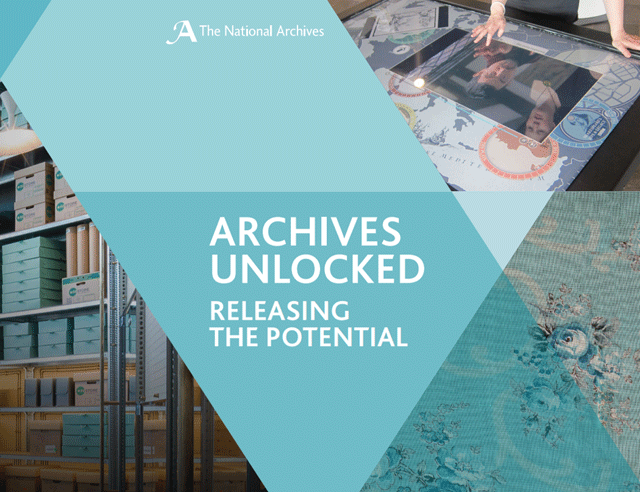 The National Archives, Archives Unlocked – Releasing the Potential: http://www.nationalarchives.gov.uk/documents/archives/Archives-Unlocked-Brochure.pdf (accessed 15 May 2018). Gov.uk, Minister for Digital and Culture Matt Hancock’s speech at the launch of ‘National Archives: Archives Unlocked’: https://www.gov.uk/government/speeches/minister-for-digital-and-culture-matt-hancocks-speech-at-the-launch-of-national-archives-archives-unlocked (accessed 15 May 2018). The reference group consisted of: Mike Anson (Bank of England Archive/Business Archives Council), Rob Baker (Blind Veterans Association/Charity Archivists and Record Managers), Kevin Bolton, (then at Archives+/Greater Manchester Archives and Local Studies Partnership), Judy Burg (Durham University/Higher Education Archives Programme), Sam Johnston (Dorset History Centre/Archives First), Andrew Flinn (University College London/Forum for Archives and Records Management Education and Research), Chris Mumby (The National Archives), Arike Oke (then at Rambert Archive), Geoff Pick (London Metropolitan Archives/Archives & Records Association), Gary Tuson (Norfolk County Council/East of England Regional Archives Council/Chief Archivists in Local Government Group), Simon Wilson (Hull History Centre). The Independent Police Complaints Commission was replaced by the Independent Office for Police Conduct on 8 January 2018. For the website of the Hillsborough Independent Panel see: http://hillsborough.independent.gov.uk/ (accessed 15 May 2018). Barnardo’s ‘Our History’: http://www.barnardos.org.uk/what_we_do/our_history.htm (accessed 15 May 2018). John Lewis ‘Memory Store’: http://www.johnlewismemorystore.org.uk/category/heritage_centre (accessed 15 May 2018). Know Your Place – West of England: http://www.kypwest.org.uk/ (accessed 15 May 2018). The Pilgrim Trust: https://www.thepilgrimtrust.org.uk/ (accessed 15 May 2018). The National Archives, Archives Revealed: Wolfson Foundation announces support for cataloguing programme: http://www.nationalarchives.gov.uk/about/news/archives-revealed-wolfson-foundation-announces-support-for-cataloguing-programme/ (accessed 15 May 2018). 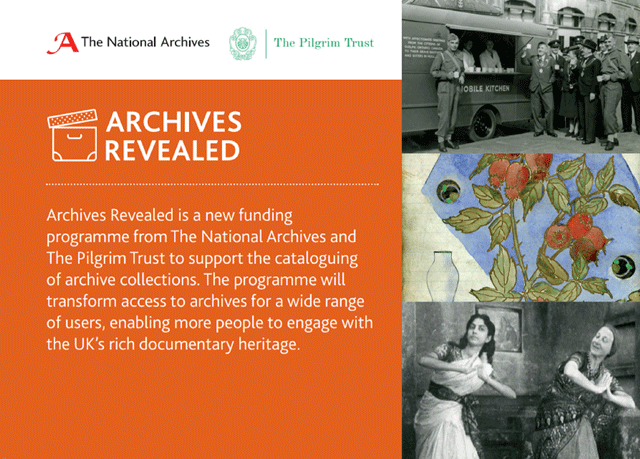 The National Archives, Bridging the Digital Gap project secures funding: http://www.nationalarchives.gov.uk/about/news/bridging-the-digital-gap-project-secures-funding/ (accessed 15 May 2018). 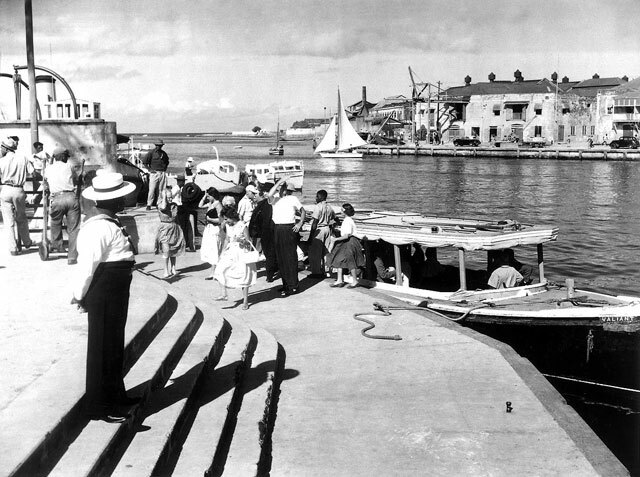 Archives and Records Association UK and Ireland: http://www.archives.org.uk/ (accessed 15 May 2018). Digital Preservation Coalition: http://www.dpconline.org/ (accessed 15 May 2018). Tate: http://www.tate.org.uk/ (accessed 15 May 2018). Jisc: https://www.jisc.ac.uk (accessed 15 May 2018). Research Libraries UK: http://www.rluk.ac.uk/ (accessed 15 May 2018). The National Archives, Digital Strategy March 2017: https://www.nationalarchives.gov.uk/documents/the-national-archives-digital-strategy-2017-19.pdf (accessed 15 May 2018). Ada National College for Digital Skills: https://ada.ac.uk/ (accessed 15 May 2018). Wilkes S, 10 January 2018, Digital Apprentices at the National Archives, The National Archives Blog: http://blog.nationalarchives.gov.uk/blog/digital-apprentices-national-archives/ (accessed 15 May 2018). The National Archives, Digital Research Roadmap June 2017: http://www.nationalarchives.gov.uk/documents/digital-research-roadmap.pdf (accessed 15 May 2018). The National Archives, Research Strategy December 2017: http://www.nationalarchives.gov.uk/documents/research-strategy.pdf (accessed 15 May 2018). Engineering and Physical Sciences Research Council, Details of Grant: http://gow.epsrc.ac.uk/NGBOViewGrant.aspx?GrantRef=EP/P03151X/1 (accessed 15 May 2018). The National Archives, Traces through time: http://www.nationalarchives.gov.uk/about/our-role/plans-policies-performance-and-projects/our-projects/traces-through-time/ (accessed 15 May 2018). The National Archives, Archives Inspire the world: http://www.nationalarchives.gov.uk/about/our-role/plans-policies-performance-and-projects/our-plans/archives-inspire-the-world/ (accessed 15 May 2018). The National Archives, Friends of The National Archives: http://www.nationalarchives.gov.uk/about/get-involved/friends-of-the-national-archives/ (accessed 15 May 2018). Kershaw R, 16 January 2018, Opening up our prisoner of war collection, The National Archives Blog: http://blog.nationalarchives.gov.uk/blog/opening-prisoner-war-collection/ (accessed 15 May 2018). Oldenburg University: http://www.uni-oldenburg.de/en/news-single/art/prize-papers-in-akademienprogramm-aufgenommen-3225/ (accessed 15 May 2018). International Council on Archives, Forum of National Archivists: https://www.ica.org/en/forum-national-archivists (accessed 15 May 2018).